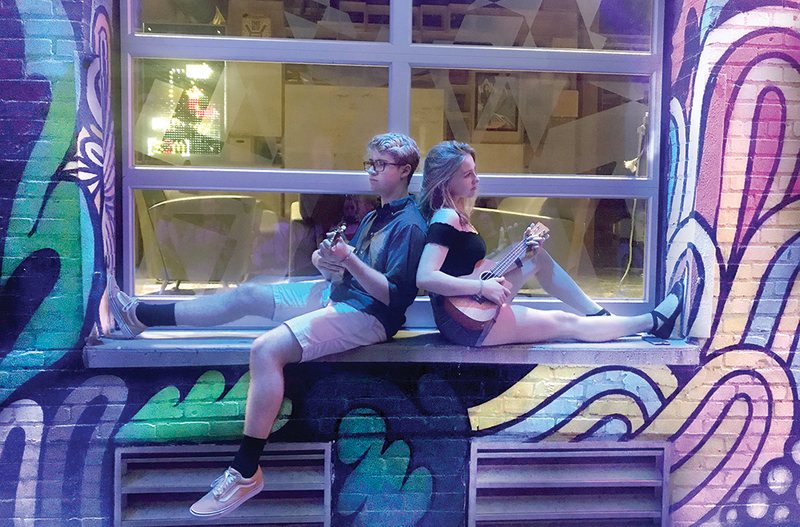 Jimmy Waltman and Camille Ladendorf play their ukuleles in a Lincoln, Neb., alley windowsill. Photo courtesy of Jimmy Waltman. 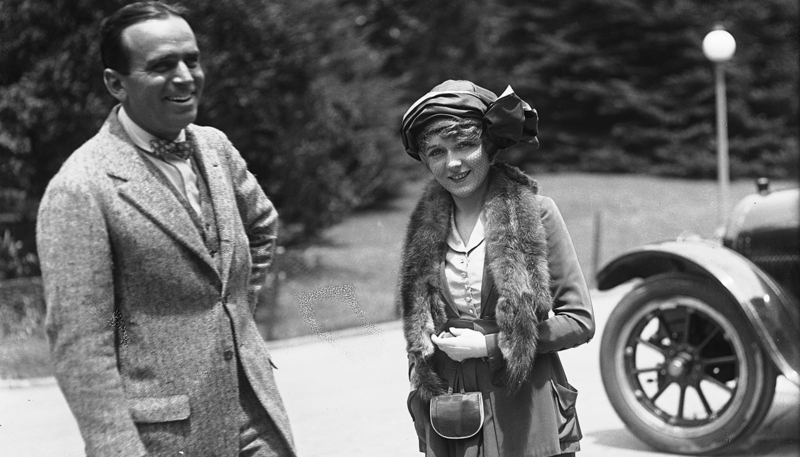 WHAT HAPPENS when thousands of Thespians invade a sleepy college campus for an entire week? 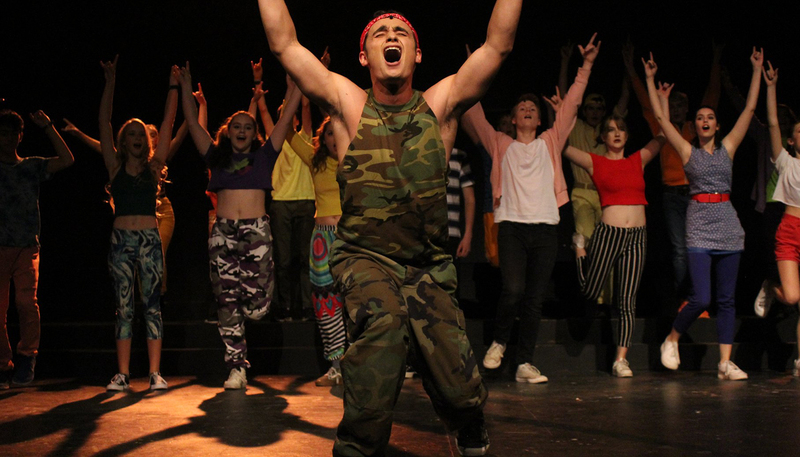 Jimmy Waltman, a senior at Hopewell Valley Central High School in Pennington, N.J., has attended two International Thespian Festivals. 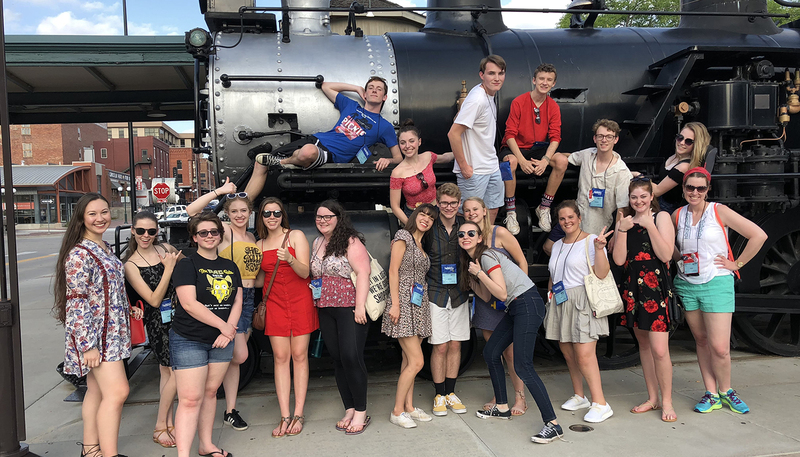 Last year, when his Thespian Troupe 7964 qualified to perform an excerpt of the play Picnic as a Chapter Select, we asked Waltman to document his week at the festival. 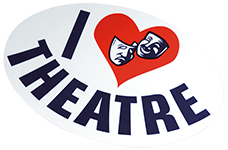 This is one Thespian’s play-by-play of daily life at ITF. Nineteen student Thespians and two drama teachers from my school boarded the school bus and left Pennington for the Philadelphia airport. Everyone was exhausted but excited. We got off the bus in the wrong spot, so we had to run through four terminals, but we all caught our flight. Goodbye, Philly. Hello, Lincoln! We landed in Omaha. About seven of us didn’t have our luggage, but we were happy and excited for the festival anyway. Our troupe went out to lunch in Lincoln at Noodles & Company. The noodles were supreme, and the company was terrific (ha ha ha). 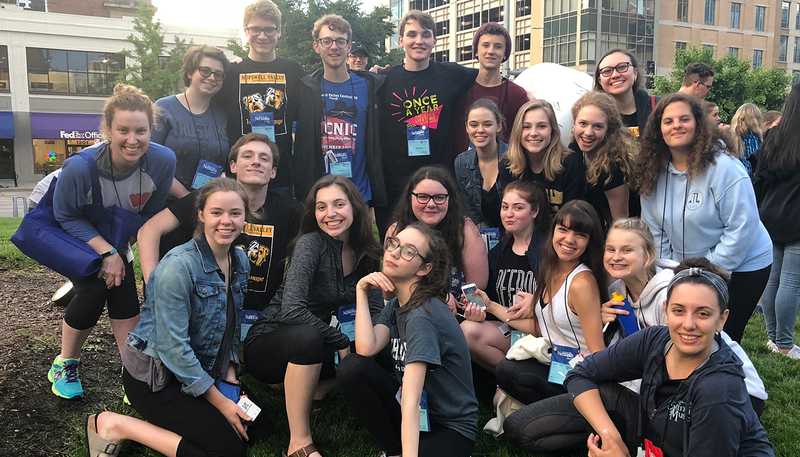 We all walked to the Lied Center, which houses the festival main stage and exhibition booths in Lincoln, to take a New Jersey Thespians picture, and we met kids from the other New Jersey schools, including Ewing and Toms River. The opening ceremony at the Lied was amazing! We watched Purple Dreams, a documentary about one of the first high schools to perform The Color Purple. 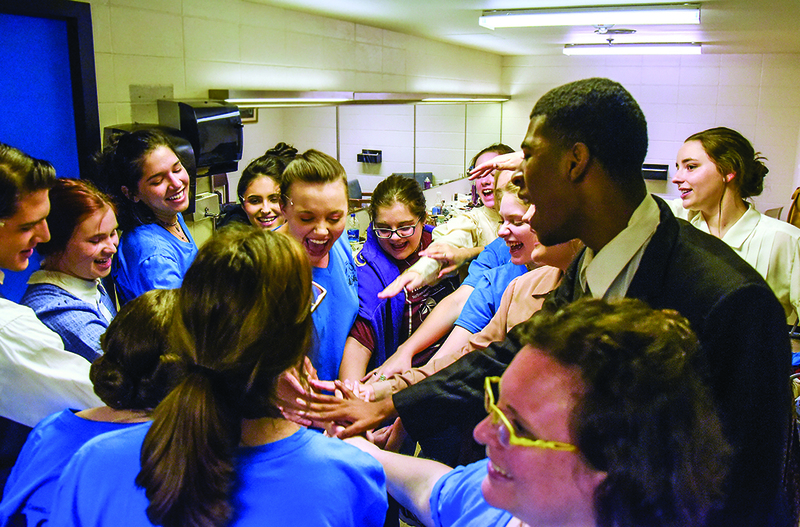 It was really inspiring to see how Thespians from the Northwest School of the Arts in North Carolina became a family through theatre. We woke up for breakfast, and then did some last-minute work on our Individual Events. We squeezed 19 people into various competition rooms to watch our troupe’s musical theatre solo (Taylor Rae’s “Whatever Lola Wants”) and our group musical theatre number (Thomas, Donavan, Caroline, and Madeline performing “Nine People’s Favorite Thing”). Another group and I performed our musical theatre duets. And we got to see some amazing pieces from other troupes. 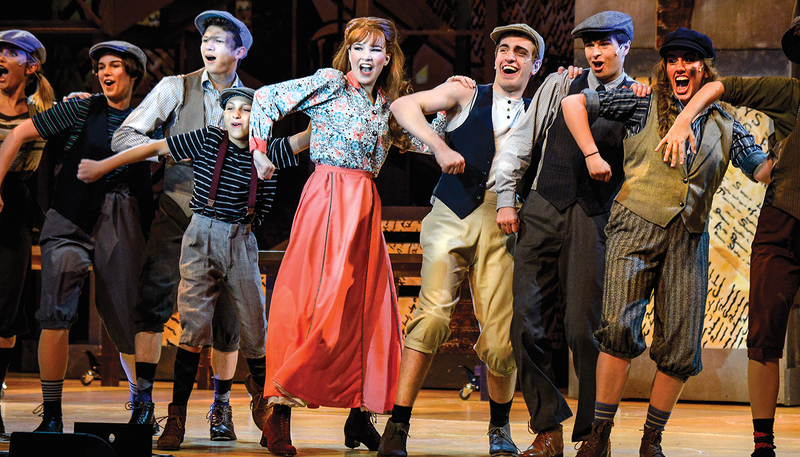 After lunch, we saw Newsies at the Lied Center, and everything about it was fantastic! The dancing and the set were particularly incredible. We couldn’t believe it wasn’t a professional production. The whole troupe met in the mess hall for dinner, and then the juniors spent some time working on our college auditions. Nervous but excited for tomorrow! We went to the first dance and met some new people around the fountain outside the Student Union building. All the juniors met early for breakfast and then walked over to the building for college auditions. 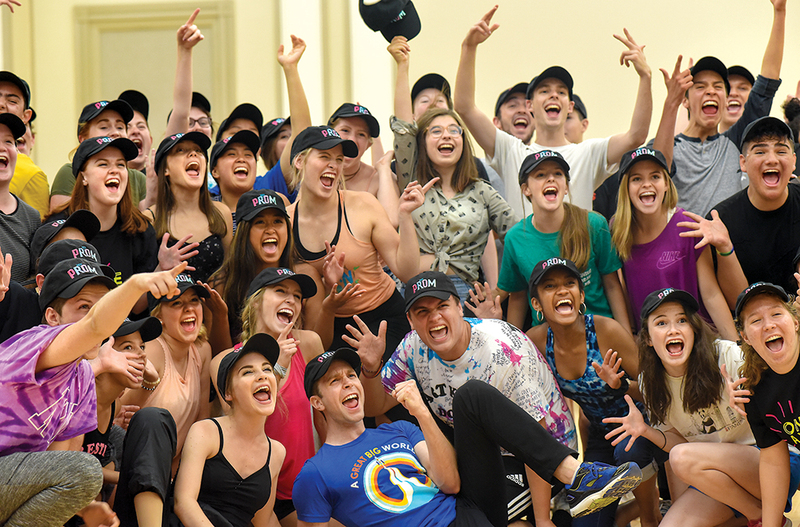 There were about 90 auditioners and representatives from the different colleges all together. I was pretty nervous, but so was everyone else who was auditioning. We were all in the same boat, so everybody was really supportive, and I made a few new friends. I managed my nerves just by watching other people’s incredible auditions and trying to enjoy the experience. We watched IEs performed by our troupe members Emmie and Maeve, who had back-to-back contrasting monologues (one comedic and one dramatic). They were both phenomenal. We saw Freaky Friday at the Kimball Theatre, and it was another great show. 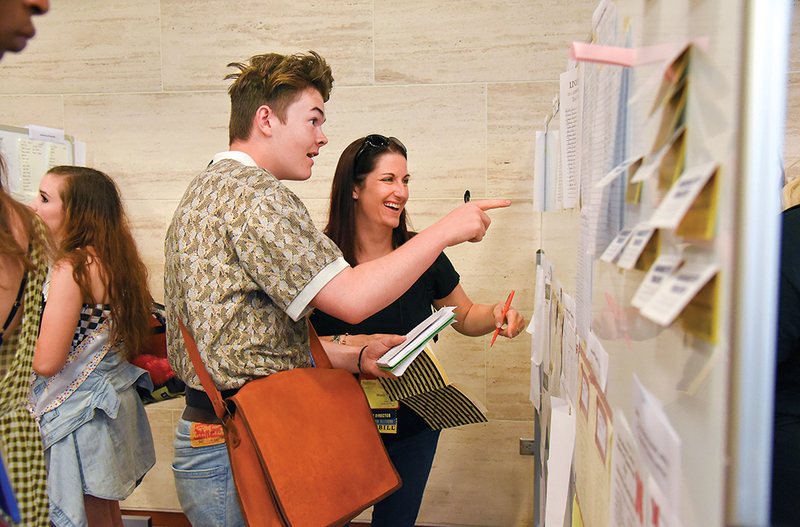 Afterward, we checked the callback board to see which colleges had invited the juniors for interviews or additional auditions. All the juniors were called back for a bunch of schools. We went out to dinner in Lincoln as a troupe, and then got ice cream and took pictures around the city. I continued writing “You Can’t Spend Too Much Time in Lincoln, Nebraska.” We also found out that Maeve and Emmie were both called back for their IEs! Our troupe and the troupe from Ewing played a big volleyball game outside our dorms until the lights shut off and we had to go to bed. 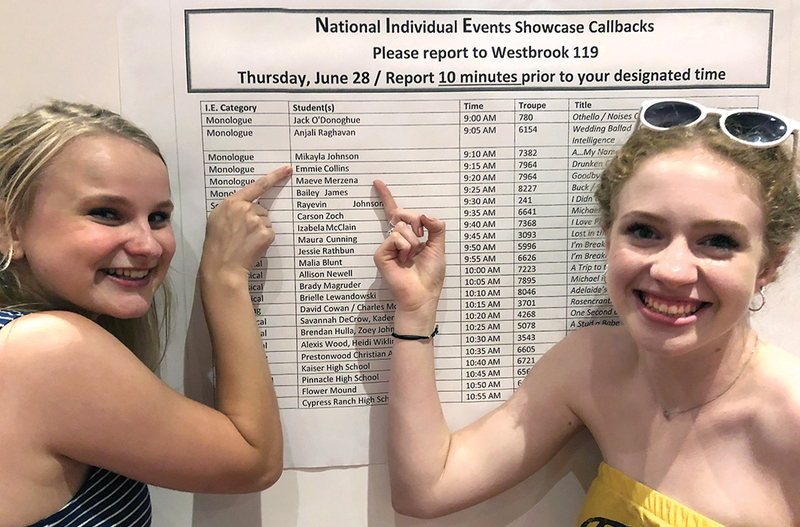 Emmie Collins and Maeve Merzena point out their names on the NIE Showcase callboard. Photo courtesy of Jimmy Waltman. After breakfast, all the juniors went to the Lied and talked to representatives at college booths. I was pleasantly surprised that most of the “callbacks” were just invitations to meet people from each school and talk about their programs. The whole process was very casual and stress-free, and it was really exciting to meet so many friendly people genuinely interested in us. I would definitely recommend that any juniors at the festival next year talk to colleges, even if you don’t participate in the auditions. The idea of walking up to a booth and introducing yourself can be a little intimidating, but every representative there is really nice and approachable. We ate lunch and then went back to the Lied as a troupe to see Big Fish. By the end, half of our troupe was sobbing at the beautifully sad plot. After the show, we found out that Emmie was selected to perform in the IE Showcase! Our troupe had dinner and then walked to the Kimball to see Urinetown. Every show we see gets more unbelievable! We went to the dance, and a lot of our troupe ended up just talking to other Thespians outside the Student Union building again and making more new friends. Our troupe went to the IE Showcase on the Lied Center main stage to watch Emmie and incredible actors from other troupes, and a couple of juniors and I went to more callbacks for colleges.  I met with Marquette University and University of Minnesota/Guthrie Theater. Representatives from both schools talked about what classes and performance opportunities they offer and asked me what kind of program I’m looking for. During my callback with Marquette, I got to workshop a monologue I’ve been working on with a university faculty member. Everything was still really relaxed and fun. We met for lunch, and then the cast of Picnic left to rehearse for their performance on Saturday. Eleven cast members and one stage manager from our troupe were all working on the show for our Chapter Select, which is a cutting from a play performed with costumes, props, and set. We competed with Picnic at the New Jersey State Thespian Festival, where we qualified to perform at ITF. 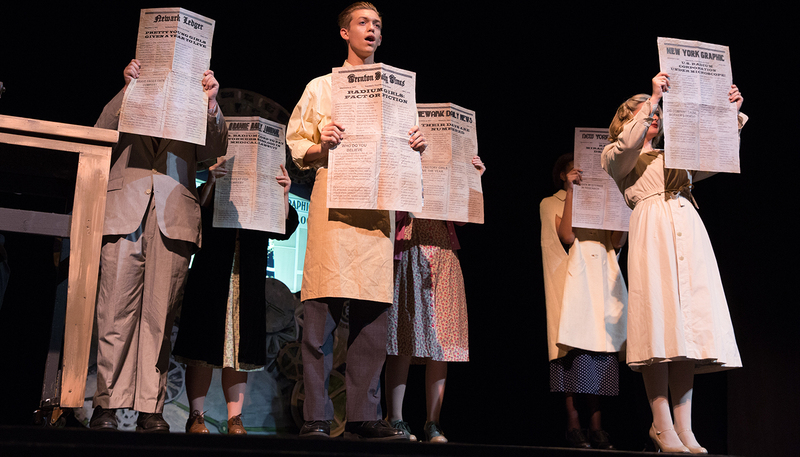 The play is about a troublemaking drifter who ends up in a sleepy town in Kansas. I had some free time, and I knew students who couldn’t make it to a show, so they let me have one of their tickets. I saw Silent Sky at the Kimball. It was a unique and interesting play about Henrietta Leavitt, one of the first female astronomers to earn the respect of the male-dominated scientific world of the early 1900s. Our troupe met at the Lied to see Bright Star, and it was amazing as well! 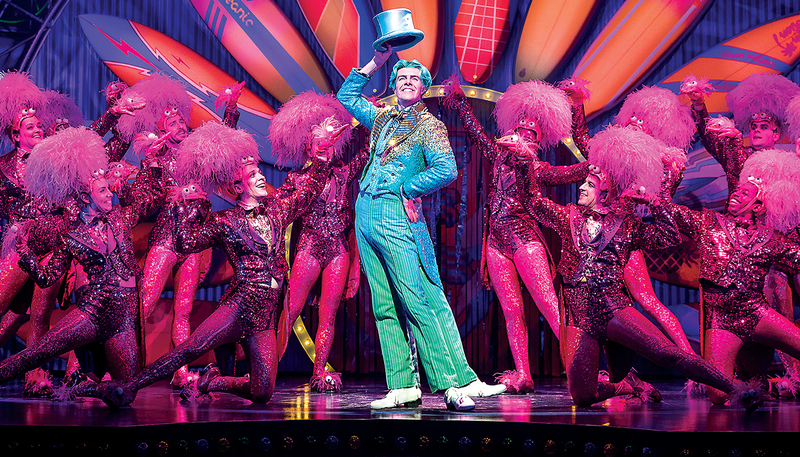 I’ve always loved the folk music of Steve Martin, who composed the music for the show, and the actors and band did a fantastic job performing it. I went to see the Carner and Gregor cabaret. 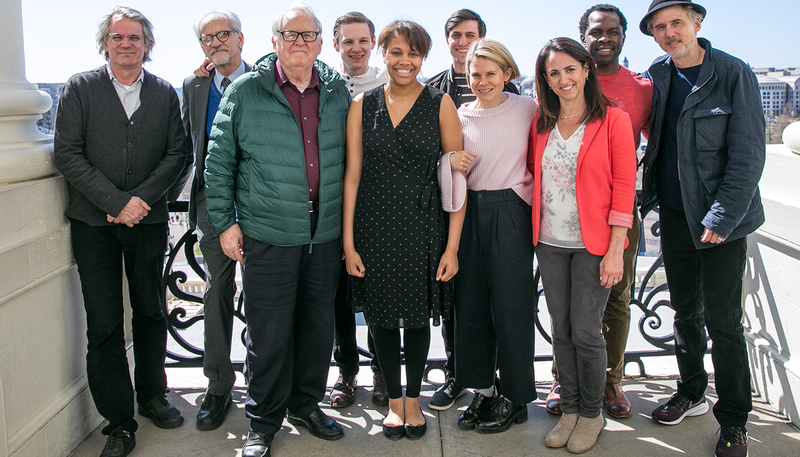 For this evening event, Thespians who had attended a workshop and rehearsals with musical theatre writers Sam Carner and Derek Gregor during the week performed Carner and Gregor’s music at the Howell Theatre near the Lied Center. 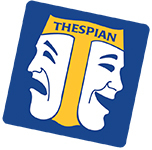 A friend and I went to the Thespian Playworks performances to see some fantastic original plays and a musical written and performed by Thespians. We saw Umtya (The String) by Frances Timberlake, Stratocumulus by Sofia Bottinelli, and How to Get a 5 on the AP Test (Without Really Trying) by Mitchell Huntley. We went to the Lied to see Trap, and it was really interesting! I’d been a bit skeptical about a horror play, but I was sincerely scared, and I loved how the mystery unfolded. I watched our troupe’s Chapter Select from Picnic at the Howell Theatre, and I was overflowing with pride for our troupe. It was a great way to end the festival. We moved out of our rooms and boarded the bus to Omaha. I played “You Can’t Spend Too Much Time in Lincoln, Nebraska” one more time for good measure, and the entire bus sang along. We got on the plane and left for Philly. Farewell, ITF. It was an unforgettable week. This story appeared in the February 2019 print issue of Dramatics. Subscribe today to our print magazine. 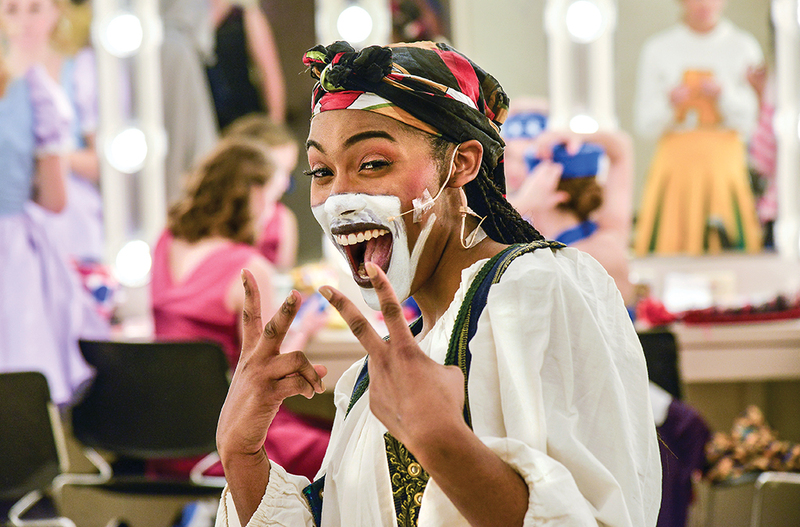 An actor from Illinois All-State Cast and Crew gets into makeup for Big Fish. Photo by John Nollendorfs. Thespians demonstrate dance moves during college auditions. Photo by Corey Rourke. 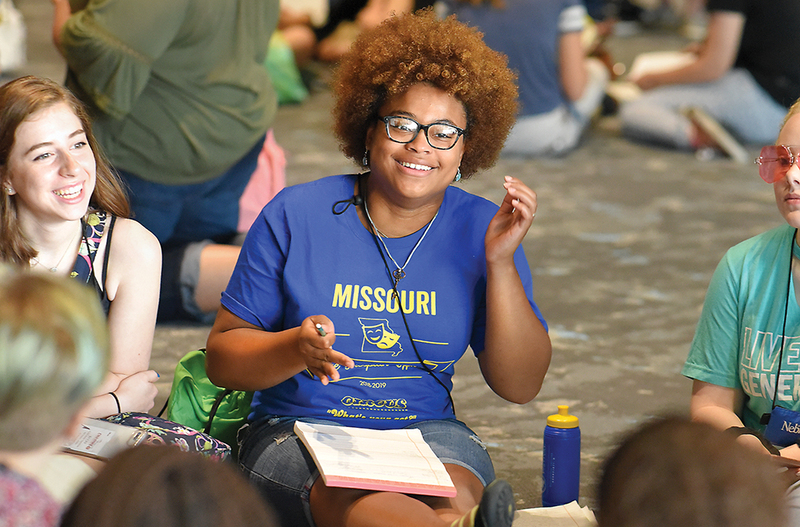 A Missouri Student Thespian Officer steers a leadership discussion. Photo by Susan Doremus. Dancers preview choreography from The Prom. Photo by Susan Doremus. 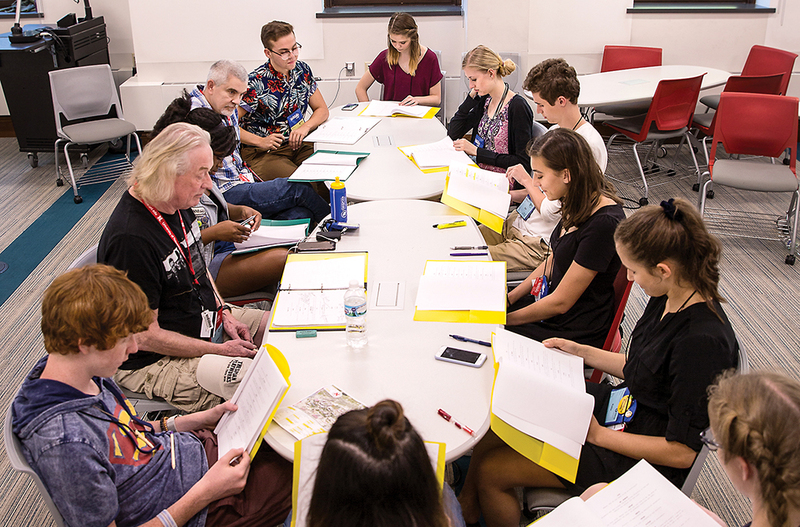 Artists gather for a Thespian Playworks table read. Photo by Corey Rourke. 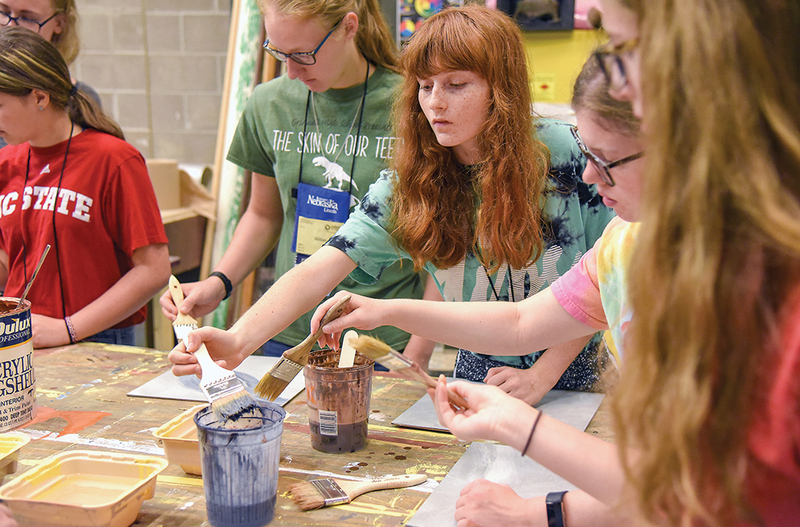 Students learn painting techniques. Photo by Susan Doremus. Troupe 2075 students from Mt. Carmel (La.) Academy share a pre-show moment. Photo by Susan Doremus. 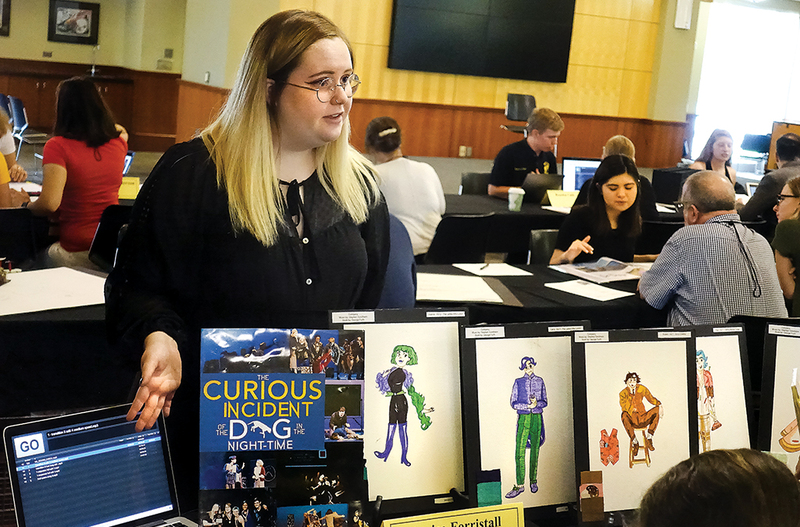 A costume designer presents her renderings at College Tech Auditions. Photo by Geri Shields. International Thespian Officer Shaila Seth finds a friend. Photo by Susan Doremus. 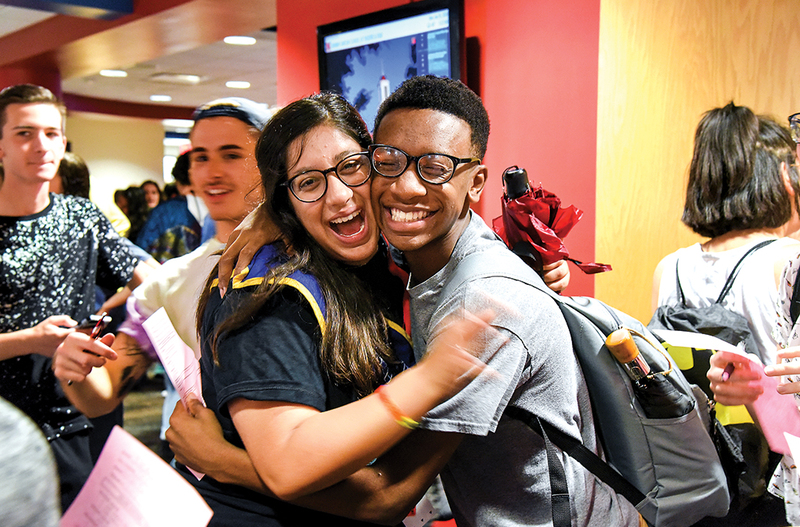 Students check the college callboard. Photo by Susan Doremus.